In a magical valley, protected by the ancient spirits of the towering Catskill Mountains, a sacred fire was lit. Surrounded by golden woods and in the cool, still evening air of mid-October 2004, the fire initiated an unprecidented and historic gathering of thirteen remarkable indigenous Grandmothers from around the world, keepers of their tribes’ teachings from original times. The Grandmothers had come to fulfill an ancient prophecy, known by many of the world’s indigenous tribes: “When the Grandmothers from the four directions speak, a new time is coming.” The urgency of the world’s perilous situation requires a global response. As the wise women, curanderas, shamans, and healers of their tribes, each Grandmother brought to the council new visions and prophecies for humanity, their tribes’ rich and varied sources of wisdom, and each tribe’s unique and secret teachings for living within the Divine Order of all things. Their International Council of Thirteen Indigenous Grandmothers met with other wise women elders – Alice Walker, Gloria Steinem, Carol Mosely Braun, Wilma Mankiller, Tenzin Palmo and H.H. Sai Ma, among others – whose insightful contributions are also included in this book. 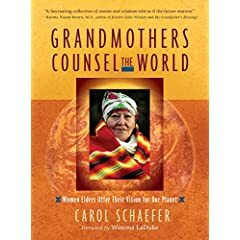 This new book, Grandmothers Council the World , by Carol Schaefer, author of The Other Mother: A Woman’s Love for the Child She Gave Up for Adoption , introduces these extraordinary women, their views on relationships and women’s wisdom, their ideas for healing the Earth as well as ourselves, their plans for ending war and poverty, for bettering life on our planet, and their revelations about the importance of prayer. Publication date was Tuesday, November 14. The book can be found or ordered now at bookstores, and on Amazon.com or Barnes&Noble.com. Carol Schaefer, a reunited 1st mother, authored The Other Mother: A Woman's Love for the Child She Gave Up for Adoption (SoHo Press, 1991). The book was listed by Penguin Reader's Guide in 500 Great Books by Women, a list that goes back to the 11th century, and was adapted for television by NBC in 1995. The TV movie is now one of the most popular movies on Lifetime Television for Women. Carol edited the photo/essay book, Sacred Connections: Stories of Adoption (Running Press, 2001). She wote the play, The Sacred Virgin in 2001. Her book Mary Queen of Scots, A Spiritual Biography, was published in the spring of 2002. Her latest book, An Ancient Tear was published in 2004. Ms. Schaefer has appeared on many national and local television and radio shows, and speaks at conferences worldwide on adoption issues.